Once of the most fascinating aspects of owning a pet tarantula is feeding time, though it's not necessarily an experience the squeamish will enjoy. The tarantula likes her dinner live. The key to keeping your pet tarantula healthy is to ensure her bugs are balanced to provide all necessary nutrients. Tarantulas are carnivorous -- or, better put, insectivorous. That means their primary diet consists of insects. Crickets are a favorite, but pet tarantulas will eat beetles, moths, houseflies and grasshoppers. Feeding a variety of insects will ensure that your spider gets all the nutrients she needs to stay healthy. Tarantulas are predators, which means they like to hunt their prey. Although some tarantulas might eat frozen or dead mealworms or crickets, others turn their faces from dead meat. Instead, buy live insects you can drop into the tarantula's habitat and let her eat on her own terms. Adult pet tarantulas need to be fed only once a week or every 10 days. Baby and teen tarantulas might need to eat several times a week. Still, going without food for a few days is not a major problem for your spider, even young spiders, so don't worry if you see a cricket still chirping around a few hours after dropping it into the tank. Remove any insect not eaten within 24 hours, though. It can actually be stressful to tarantulas to see live insects hanging around for long periods of time. When cleaning your tarantula's habitat, check for food remains such as dead insects or parts left behind. 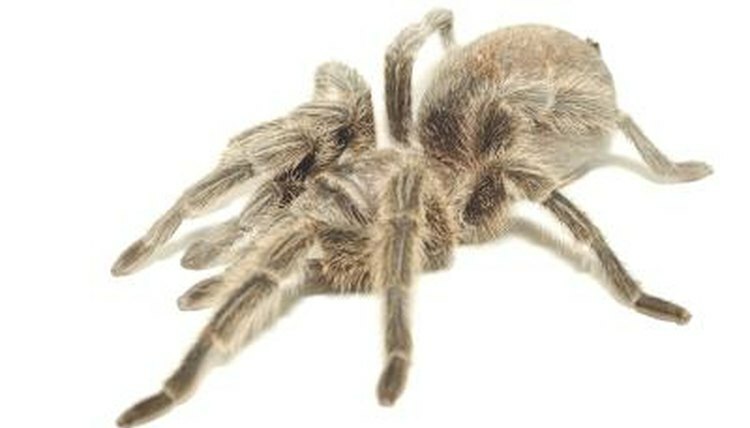 Dead animals can attract mold and ants, both of which can be dangerous to your pet tarantula. And you don't want your spider eating rotten food, as this can be quite unhealthy.